Hmmm, I like the bio-organic alien tech idea. Kitenerd is right, I would probably use that in fantasy settings. Now come to think of it, why not just make one of those for fantasy settings. There are catacombs and the like. Make a flesh dungeon. Might be hijacking the thread a bit on that one. ShadowSoul wrote: Just a quick question if we were to do a sci fi set what style and what type of things would you like to see? Is this still a possibility? I think "generic" sci-fi can be done, and was done well with the existing Sci-Fi sets. 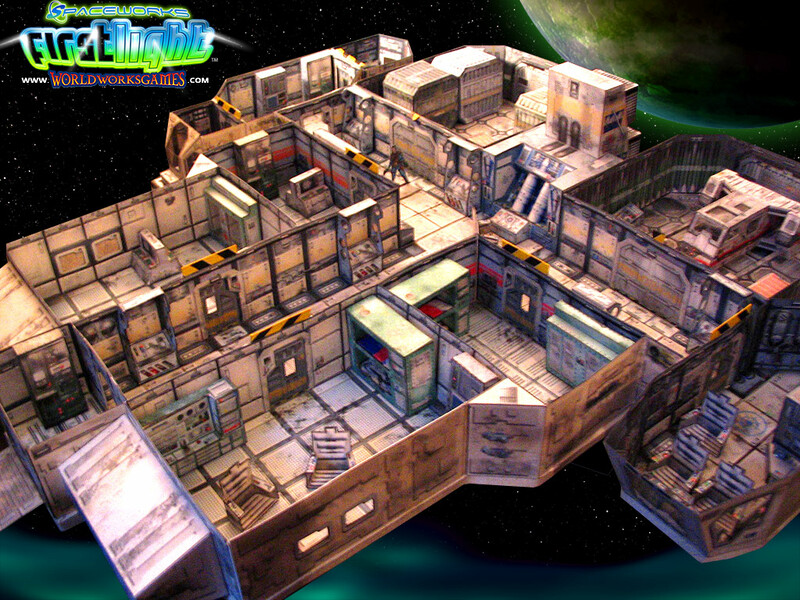 The floors work fine for Alien, Firefly, Star Wars, Space Hulk, or any other metal structure set in space. The blue terminals and blue/red coloring is a bit more retro/1950s sci-fi (Buck Rogers perhaps) but doesn't seem out of place as something that might exist in other sci-fi settings. 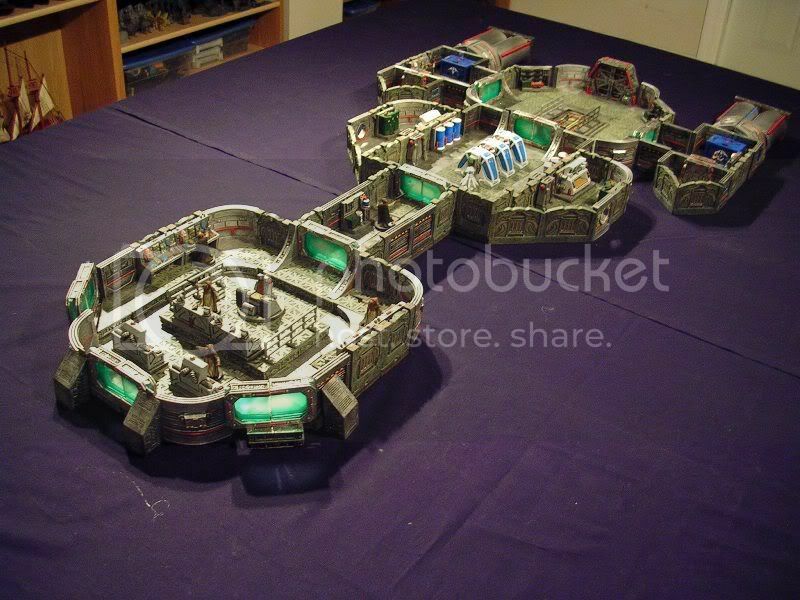 As a continuation/expansion to the Dwarven Forge Sci-Fi line, I'd love to see modular exterior walls and roofs -- pieces that are detailed as playing surfaces for both the inside and outside of a ship or space station. I'd also like them to be stackable, so I can build a ship with multiple levels without worrying about it toppling during exploration. Portals that open at the roof and exterior cargo bay doors would be great, too. Maybe even some modular exterior walls/roofs that have scenery bits attached (or slots where something can be attached) -- weapons, cranes, solar panels, wings, massive telescopes, radar dish, etc. Basically, I'd like to build a space ship on the table, and have PCs investigate it by landing on the exterior, finding a way inside, and exploring. This would make a great Space Hulk or Firefly mission, or even something like exploring a crash-landed UFO (like the old X-COM computer games). IIRC, one of the issues that plagued the Sci-fi line was that, while Fantasy fans on the whole agree about the most basic (and therefore versatile) fantasy settings, there is nothing like that consensus with Sci-fi. With fantasy, you can do a ton of different layouts with a basic flagstone set like the dungeon sets used. Add caverns and a Tudor design like MBS, and it goes up exponentially. So many fundamental fantasy settings are covered: castles, dungeons, hamlets, caverns, mountains, temples. And within those, you can do libraries, garrisons, torture chambers, prisons, shrines, natural lairs, and so on and on and on. So it feels like the vast majority of possible Fantasy settings are covered with just a few basic designs. With Sci-fi? First of all, you've got the problem of licensed properties. The most popular Fantasy story ever, LOTR, didn't even HAVE iconic imagery until fairly recently, and what it does have is so beholden to the generic tropes it pretty much invented it barely counts. But Sci-fi is just STREWN with beloved iconic properties, and a lot of Sci-fi fans want something that's either EXACTLY that, or close to it. You've got Star Wars, Star Trek, Alien, Starship Troopers, Road Warrior .... all of them extremely different and all of them extremely specific. And even APART from that, assuming someone's love of Sci-fi doesn't stem so directly from a love of one of these properties that they wouldn't be interested in anything that didn't match it fairly closely -- you've still got sci-fi settings that are VASTLY different and more heterogeneous than what you get in Fantasy. In many ways, anywhere you go in Fantasy, no matter what it is, it's gonna be made of stone. Doesn't take much of a stretch to make that fit. But in Sci-fi -- well, your city won't look like your spacecraft which won't look like your starbase which won't look like your many many many crazy planets none of which look alike. DF did, IMO, a phenomenal job in creating something for Sci-fi that approximated the versatility of the Fantasy dungeon sets. The basic patterns and design could work in a spacecraft, or a starbase, or a satellite, and so no. People like IO were able to exploit the design of the pieces to get a really wide variety of Sci-fi locations out of them. But another issue comes up, too -- Sci-fi does well when you get a large degree of diversity in the settings. Empire Strikes Back - we move from the icy plains of Hoth, to the hold of the Millennium Falcon navigating an asteroid field, to the swamps of Dagobah and the spires of floating Bespin..... Fantasy, to be fair, likes variety as well, and DF sets that aren't dungeons can do SOMETHING to fill in the gaps -- Hellscape, and DOE, and even ROTA could all work for alien settings. But ultimately, you can trick out Fantasy with bookshelves or tables or torture devices of piles of gold and create workably distinct locations just with accessories. With SF, you run a greater risk of it feeling repetitive. It's just harder to pull off. Plus -- DF SF was never going to be a Death Star. It was never going to be the bridge of the Enterprise. It was never going to be the Nostromo. It was never going to be Thunderdome. I'd love to see it come back, but that's a nut that remains to be cracked. I think it contributed to the disparity between how well the Fantasy sets sold and how the SF sets didn't. How well would the Medieval City Builder System work for sci-fi, in terms of supplying more "building" and "corridor" type components? It would allow for multi-level structures, great for sci-fi cities and cargo holds, or space ship levels with maybe an elevator piece. Having played just a little bit with the few sets of Sci-Fi i have, the thing that stands out is the complete lack of straight walls. If you want to build a large engine room or bridge, you simply don't have enough walls to go around the edges. Alpha gives us great large floors to build around, but with only 3 straight walls per starter set the math doesn't work. It takes 3 Starter sets just to enclose the 4x6 floor (with one door), and 4 starter sets to enclose the 6x6. Obviously there are some creative ways to get around this and not all rooms need to be (or should be) rectangular boxes, but still this set seems really lacking in basic boring walls. Hopefully any planned addition to the line will include a few different basic walls. I think the big thing that would make me get in on a sci-fi set would be how well it would work as stand alone buildings, as well as corridors for ships. - Sci-fi furnishings - beds, tables, workstations, machinery, lockers, cargo handling gear, etc. - Small land vehicles - Mule, ATV, Gamma-goat, etc.